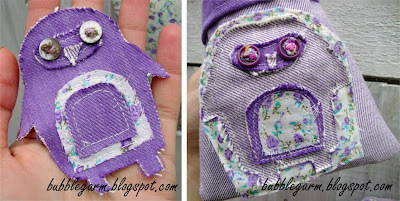 B U B B L E G A R M: Sew Cute! 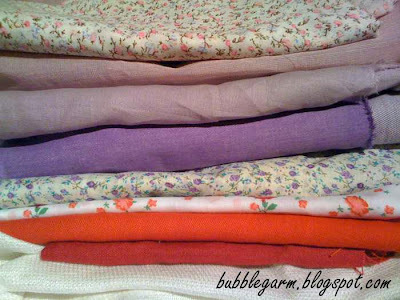 Yesterday, I spent the whole day pattern making, sewing and thinking. I ended up making a travel brush roll and a few other things. 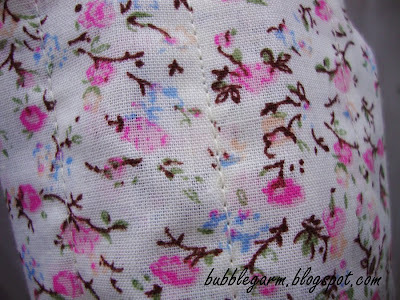 Here's a close up of the fabric that I used... Very cute and shabby chic! It has a total of 9 pockets, 4 being large and 5 being small. I used wadding for the pockets for a soft snug fit. This is just a sample, I still need to re evaluate a few things, and create a master pattern. How many pockets do you think a travel brush roll needs and would you prefer more padding for a firmer structure? Here's how it looks all rolled up! 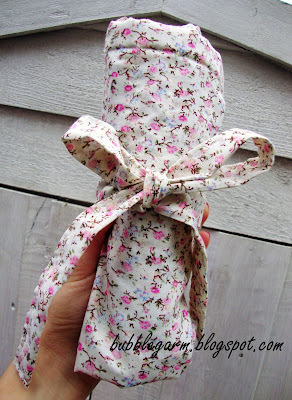 I'm thinking a patchwork brush roll will also look cute, what do you think? I also made this little pouch with a side pocket, it can be looped onto your dressing table handle, inside a cupboard or wherever else. I'm going to be using this one to store my cotton rounds! 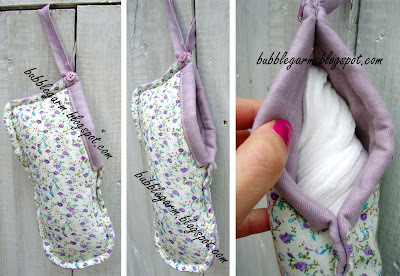 You can even put cotton buds in there and anything else that needs to look pretty! I also made these little fabric applique designs, this one is a penguin in case you couldn't guess :) I'm planning on making snowmen, hearts, birds and anything else I deem to be cute. The main purpose, is to decorate Christmas stockings that I am thinking of making. Here's the fabric I'm working with this week! I'm thinking of making some of these to sell as I am a little bit bored of making jewellery at the moment, and sewing is my new hobby. Would you be interested in any of the products? Price range will be approx £5- £10. If you have any requests and would like some input into the design, do let me know!!! I can also do personalised initials from the applique if requested. OMG You're so talented! Please can you make me one of your adorable makeup brush holders. I LOVE! Love that brush roll, you have some serious skillz :) I think that cotton round thing is genius too, I would def. use that! Oh and love the penguin! Hey doll.. just read your comment on your other post.. and you are defo right! i should be demanding lol.. I think i might have to take the pic with me.. it goes soo well with the dressing table! Is it one piece? or did you put it together? Very creative..I work in the fashion industry(special occasion dresses) and I've saved so much fabric from all the alterations over the years..what a great idea..a sequin brushholder for my daughter for Christmas..Perfect!!! You should absolutely sell them!I want one of your brush holders so count me in!! !They are adorable! i love how creative you are! 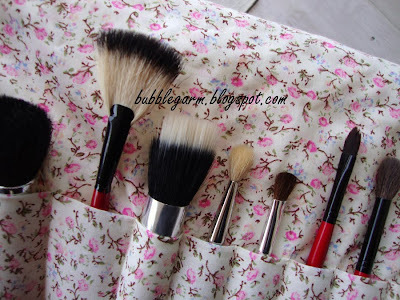 that brush roll is adorable! I would absolutely buy a brush roll the second you offered them up as I've been wanting for a while now, but dislike the plain black ones you see on various websites. I would love a bag/liner with lots of pockets which you can organise your stuff in and when u want to change handbags just change the liner with your stuff in, does that make sense?!! You are really are talented, I would definitely buy one! However I do feel inspired to make one myself! These are adorable! I'm just about to go surfing the web as I want to learn how to knit again (I was taught as I kid and now have totally forgot). I now want to make these too! im totaly going to make one! 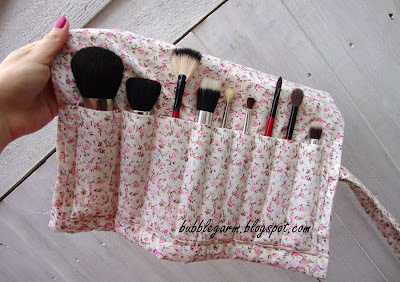 I love the fabric that you used - such an improvement over the usual boring black fabric make-up brush holders! 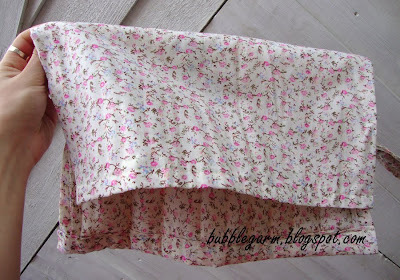 What gorgeous fabric and your designs are superb! Really inspiring. I like to keep all my long stick-like stuff in my brushroll when travelling, so pencils, mascara and lipgloss too if it can fit. It makes it more bulky, but if I'm good I can just add a palette and that's all I take. Yessss i would definitly buy a brush roll. Its soooo super cute!! The makeup brush holder is really cute! You're so talented!! I think padding the rolls would be good. I currently use a makeup brush holder that I still have to pad with clothes when I travel just to prevent the brush tips from being squished and bent, lol! These are so beautiful hun, I love the fabric and the design as well! I'd be defo intrested in your whole range in the future, especially that my earrings need some serious re-organizing! oops...i spelt your name wrong, sorry!! I absoloutly love the brush roll! Its gorgeous. I would defo buy one, you should sell them.